Giving Back | Wisconsin Converting, Inc. Despite being the official Titletown, USA, Green Bay really is a small city. We can fit 78% of the population of Green Bay into Lambeau Field, all sitting shoulder to shoulder in bleachers, cheering on our Packers. And like many small cities and towns across the United States, we take care of our neighbors that need a helping hand. The employees of Wisconsin Converting volunteer and support our community in many ways, both individually and as a group. Most recently, over the holidays, Justin in our customer service team coordinated WCI employees to, through the Salvation Army, sponsor a family for Christmas. 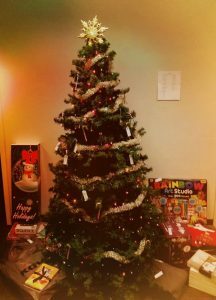 This is the fifth Christmas that the WCI staff has sponsored a family, ensuring they have a happier holiday with gifts under the tree. Our family this year was a family of five, including two parents and three children between the ages of 11 and 16. Through the Salvation Army, we are given a list of items the family might need or want, including clothing sizes. Justin takes all of those suggestions and decorates our company Christmas tree with candy canes. Each candy cane bears a tag of a gift for one of the family members. WCI employees take canes off of the tree and return unwrapped, new gifts that correspond with the candy cane’s tag, and a week before Christmas, the gifts are taken to the Salvation Army to be wrapped and presented to the family. Everyone has a good time shopping and we hope the family we sponsor enjoys their Christmas just a little bit more because of it. Throughout the year we participate in several of other charity events out in our community, including the Bellin Health Corporate Challenge run. We donate bags to local schools for events and crafts, our local Girl Scout troops, and to Newcap, helping our local homeless and underserved. It’s a great way for the WCI team to work together to better the city we call home.